After his side’s shock defeat to Ross County yesterday in the Scottish Cup semi-final, Celtic gaffer Neil Lennon thinks some of his squad will now find themselves kicked out during the summer transfer window. The shock 2-0 victory for The Staggies means that Celtic has next to no chance of winning any silverware this season, with Old Firm rivals Rangers running away with the SPL title. A despondent Lennon told the News of the World: "I don't know whether I will be here next season - but I'm pretty some of them won't be. "Too many of them have pulled the wool over a lot of peoples' eyes. I'm way beyond angry after that performance. I didn't rant and rave to the players. Obviously fed up with his underpar troops, the former Celtic captain explained: "People talk about Tony Mowbray not instilling passion in them but that has to come from within. I asked them to dig deep and they couldn't do it. "There was only one team that wanted to win today and that was Ross County. They thoroughly deserved it. We don't have enough winners. "I'm sick of watching us falling down like that. I'm sick of seeing strikers who aren't prepared to put their heads in where it hurts. At the other end we can't keep a clean sheet to save ourselves - we're just soft. "You have to have it inside you after humiliating defeats, you had to show you had something about you. Show some bottle, show some b***|\*|s, for God's sake. 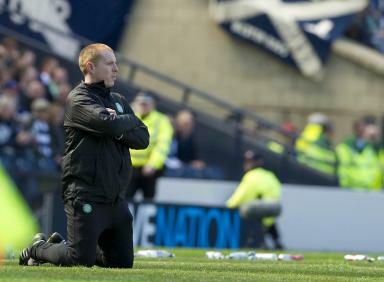 Lennon added: "It's been a shambolic season. We've gone out of every competition we've gone into this season with an absolute whimper. "We're 13 points behind Rangers in the league, we went out of the League Cup in the quarter-finals, we've gone out of the Scottish Cup in the semi-final to a First Division club and in the Europa League we couldn't get out of the group. You live or die by your strikers and Georgios Samaras and Marc- Antoine Fortune haven't been anywhere near consistent enough. "The bottom line is that we weren't good enough and we have to take the humiliation that comes with it. We've now got a big game on Tuesday. The majority of the fans will stay with us but the players don't deserve it."